Here are your 2019 Annual Forecasts! Georgia continues to write extended versions of her Annual Forecasts to make available exclusively through her website. More than twice the length of her Annual Forecasts that you may find in your local newspaper! Georgia's 2019 Annual Forecasts will be delivered to you via e-mail, as well as being available for reading online 24/7/365 through this website. No hard copy is available, but a PDF download suitable for printing or reading on your mobile phone/tablet will be available to you through this website. Unsure if Georgia's words will ring true for you? Have a read through last year's Annual Forecasts, absolutely free. Don't use a Credit Card online? 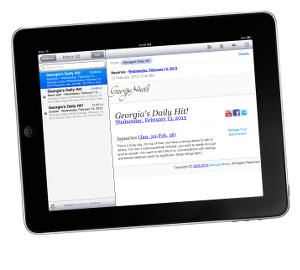 You can also order Georgia's e-mail edition of the Annual Forecasts by mail and pay by cheque or money-order. Cheque/money-orders processed as soon as they are received. When your order is processed, you will receive an e-mail from us to let you know that your order has been received. If you've never ordered from us before, you'll also receive another e-mail message asking you to activate your new Account, so that you can read your Annual Forecasts online. Add "georgianicols.com" to your "Safe Senders List" or "Whitelist" to help ensure that there are no problems in receiving your Annual Forecasts when they are e-mailed to you.